* This is my article in BusinessWorld last Wednesday, June 6. The summit meeting between US President Donald Trump and North Korea leader Kim Jong-Un (KJU) this coming June 12, 2018 in Singapore is marked with several paradoxes. For one, the US is the biggest economy in the world with a GDP size of $19.39 trillion in 2017 while the North Korean economy is very small with an estimated GDP size of only $16 billion in 2016, or just 0.08% of the US economic size. North Korea’s economy is small because it has focused its resources on its military and nuclear capabilities. As a result, most of its 25 million people are starving and are deprived of several basic services, including but not limited to reliable and dependable electricity service. Last month, a historic summit meeting was held between KJU and South Korean President Moon-Jae In with both parties discussing the formal ending of the Korean War and to finally establish peace and prosperity between the two countries in the peninsula. An important event aiding this Trump-KJU summit is the renewed vigor of the US economy by which it can reassert its role as main “anchor” of global trade, investments, and economic dynamism. Let us review some numbers as to why this may be possible. The last time the US economy posted a GDP growth of at least 3% was in 2005 or 13 years ago — it grew 3.3% that year. The eight years of “hope and change” under President Obama did not produce a single year of 3% growth or higher. During that period, 2009-2016, even anemic economies of fellow rich countries managed to grow above 3%: Japan experienced 4.2% growth in 2010, UK grew 3.1% in 2014 while Germany experienced growth of 3.9% and 3.7% in 2010 and 2011, respectively. China as second global economic “anchor” continues to grow fast but no longer in double digit figures, owing to the declining pace of its expansion. South Korea maintains a growth rate of at least 3% and it remains the 11th biggest economy in the world. 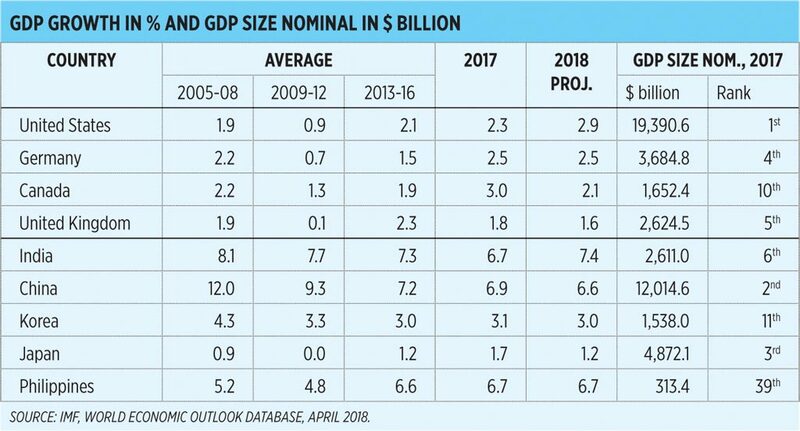 Japan remains the 3rd biggest economy and India is roaring high and is now the world’s 6th biggest economy. 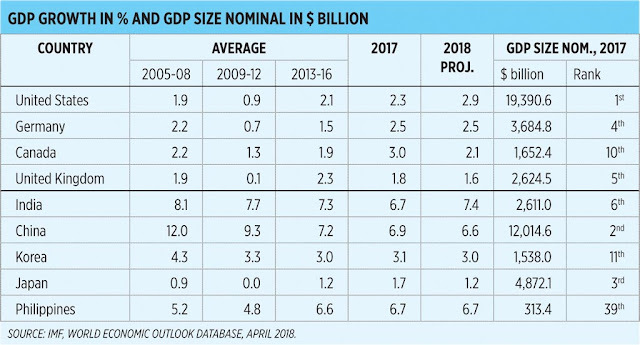 The Philippines has achieved fast growth since the last administration and the momentum is expected to be sustained until this year and the next (see table). The growth momentum of the US economy is very evident since last year: 1.5% in 2016 or the last year of “hope and change,” 2.3% in 2017 and IMF projection of 2.9% this year. Actual Q1 2018 growth was 2.8% and when the May 2018 unemployment rate further went down to only 3.8%, an 18 year-low, prompting banks and research institutes to revise their growth projections for 2018 Q2 to Q4 of 3.5% to 4.7%. With the world’s no. 1 economy rolling on high growth path and immediate neighbors being the 2nd, 3rd and 11th biggest economies in the world, the opportunities for North Korea to quickly transition from a hermit-like, autarkic economy to regional and global economic integration is high. It will not be surprising then if Apple, Samsung, Google, Microsoft, McDonalds, Toyota, Shangri-la, other big global brands will put up offices and factories in North Korea months after the Trump-KJU meeting. Is a North-South Korea reunification as one country like the East-West Germany reunification, desirable? It will be better if they remain as two separate countries linked by heavy commerce and investments, like Malaysia-Singapore and EU countries. Bigger countries and economies tend to be more bureaucratic than smaller ones. Compare for instance China-Hong Kong, Indonesia-Singapore, India-Bhutan, Russia-Finland, and so on. Peace and prosperity, more commerce and trade, more investments and tourism, more sports and cultural exchanges, more energy and electricity, and not more tanks and missiles. This is the kind of economic development in the region that many people and businesses around the world hope to see.